On 15 November there will be elections for a Police and Crime Commissioner for the West Midlands. 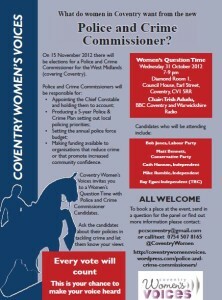 Coventry Women’s Voices have extended an invitation to a Women’s Question Time event with Police and Crime Commissioner Candidates. This will be a great opportunity to ask candidates about their policies in tackling crime. Coventry Women’s Voices have proposed a 7-point plan which they are asking all candidates to sign up to. The plan includes a commitment to reducing crime and increasing community safety and focuses on areas including sexual violence and harrassment, domestic violence and prostitution. The plan asks that commissioners ensure the police response to prostitution does not criminalise women and girls and supports programmes that prevent them entering prostitution/provide exit routes. The event will be held on Wednesday 31st October, 7-9pm at Coventry Council House. We’ll be there…..will you?